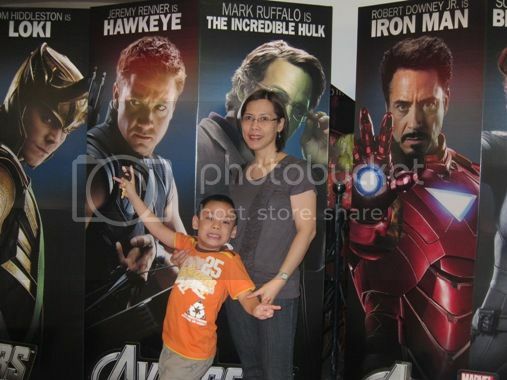 We watched The Avengers at Robinsons Movieworld last April 28, 2012. I seldom watch movies now because I often find myself sleeping inside the movie house halfway through the movie. I guess that’s because I really miss my afternoon naps or maybe because the cold movie house is very conducive for sleeping or perhaps because I’m getting older. Lol! Anyways, I’m happy to announce that I didn’t fall asleep while watching The Avengers. That’s because I really enjoyed the story, the stunts and the visual effects. I also liked that the characters in the movie did not outshine each other. On the contrary, the characters were given individual time to prove who they are and what they are capable of doing. I also found myself chuckling every once in a while because of the humor injected in the movie. 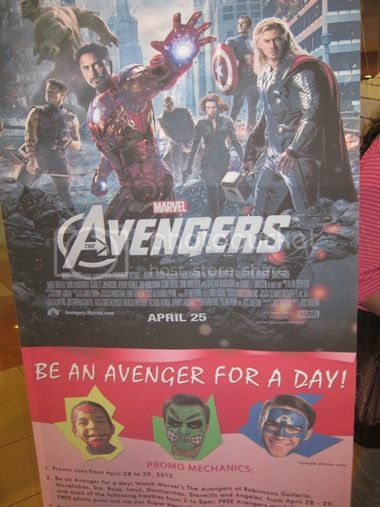 The four movie tickets we bought also entitled us to have our pictures taken at The Avengers photo booth and to get FREE Avengers mask face painting. Because it was getting late already, the little boy opted for a hand painting instead. I was standing nearby with a lot of thoughts swirling in my head, including a writing assignment about employment screening that was almost overdue, while waiting for the little boy to finish. We all enjoyed the movie. It was money well spent. 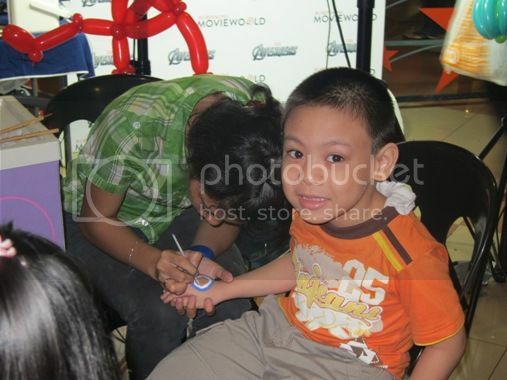 When we went home, the little boy knew who among The Avengers he liked the most – Iron Man! What I didn’t understand was why he chose to have Captain America’s shield painted on his hand, instead of Iron Man’s helmet. Did you watch The Avengers, too? 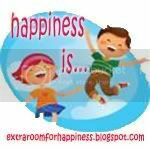 This entry was posted in Happiness Is..., Mommy Moments, Robinsons Galleria, Robinsons Movieworld, The Avengers. Bookmark the permalink. 4 Responses to We Watched the Avengers! Hi tetchy! Nauna pa ata tayo sa MM linky, hehe! We watched the Avengers same day as you did only were in SM Sta. Rosa. I also found myself laughing in some scenes and dialogues. Thanks for the comment…Adavance Happy Mothers day too! 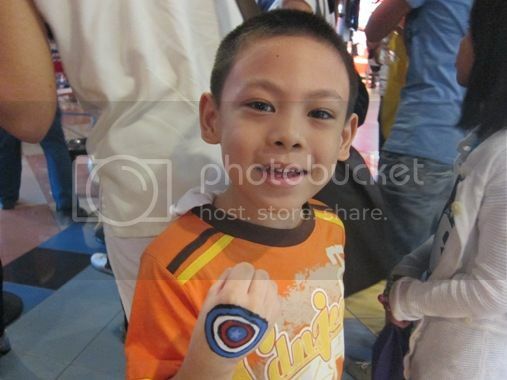 we also went to watch The Avengers last week! 🙂 The kids liked it, and so did the adults! 🙂 sorry for the late visit. Happy mother’s day! i heard a lot about this movie… made me so curious. ← Ipanema Urban Jungle Runway Show: A Fashion Show Like No Other!